This is a mod created to add a light RPG-ish feel to the game. It's designed to interact with mods that give a similar feel, namely Baubles, Tinker's Construct and Mariculture, incorporating their extended inventories aswell as its own into one single GUI. This mod adds 4 new slots, for cloak, pauldron, vambraces and a title scroll which displays certain honorary titles above the player's head. 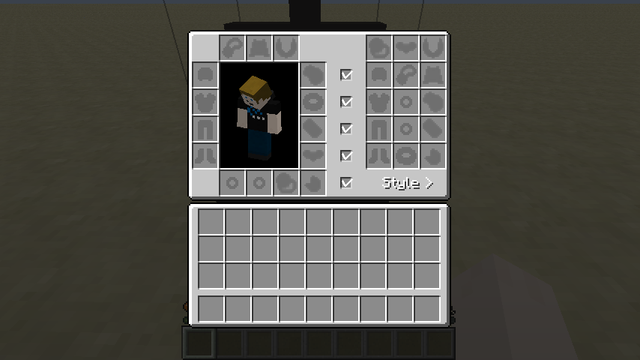 The API is designed to allow other modders to acces the extended inventory and add their own custom items. This can also be done in a more "hacky" way via IMC messages. Take a good look at the main TravellersGear class to see how it's done. It is opened by either clicking on the little book icon in the top left of your character window in the inventory, or by using the keybinding. The keybinding is Numpad 7 by default (since you're really supposed to use the button), but can be rebound. 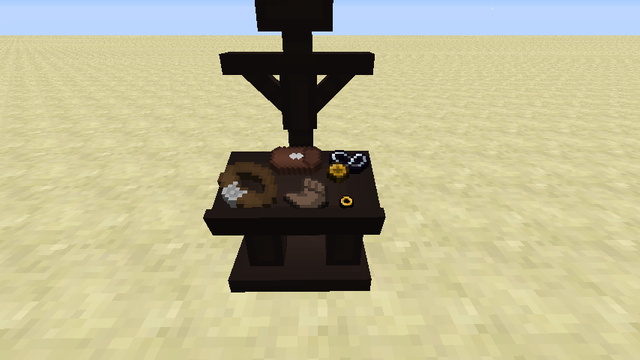 Armor, Baubles, Mariculture Jewelry, Tinkers Construct Glove and Knapsack and the Traveller's Gear items. 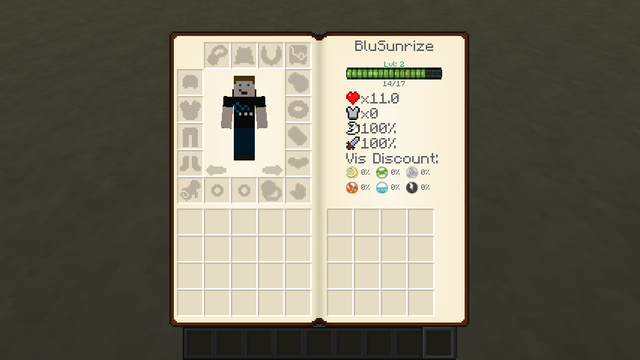 The page on the right has a few statistics, health, armor, speed, damage and with Thaumcraft installed, Vis discounts. The fully filled inventory looks like this. The Items that should be unfamiliar here should be the cloak (top middle) the pauldrons, (right, second from the top), vambraces (right, fourth from the top) and the title scroll (bottom left). 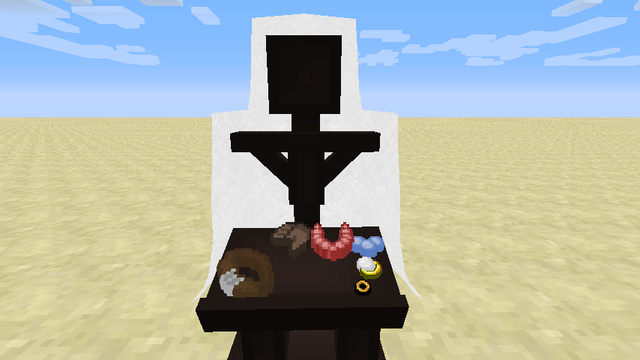 The items added by this mod have no actual abilities applied to them, but the cloak is colourable like leather armor would be. The title scroll is an item that, while it can be crafted, is best found in dungeon or stronghold chests. 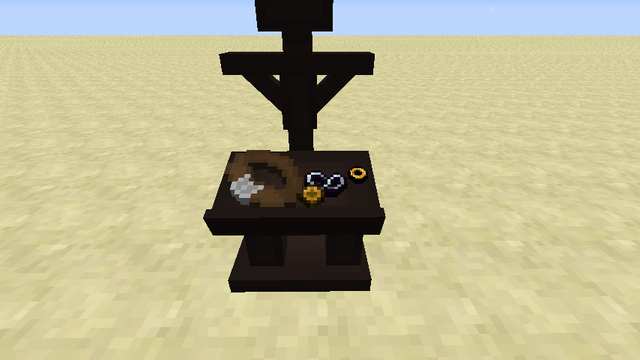 Those found in these chests have a random title added to them, and when worn, will display that title above the players head, just below their name. You can also see your title below your username in the gear inventory. It does what it says, it displays armor. But not only armor, but almost every item in your gear inventory! With this interface you can easily switch between your own equipment and that on the stand, simply by shift clicking the items. The "Style" button allows you to switch between 4 styles: Rendering Baubles, Traveller's Gear, both, or none at all. You can also disable helmet, chestplate, leggings, boots and the floorplate seperately. 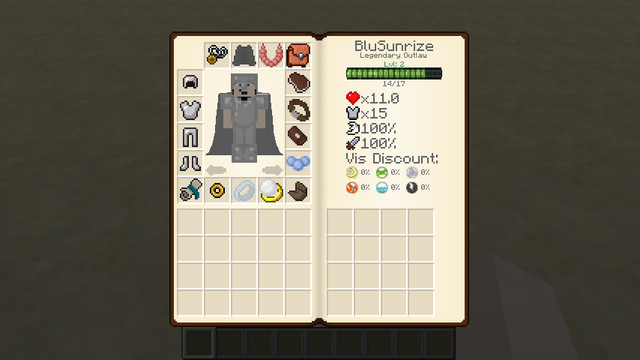 And to round up the RPG feel, you can now link Items in chat, broadcasting them to all players on the server. To do this, simply hold down CTRL and rightclick the item while in the gear inventory. This mod is specifically designed to be expanded upon. Therefore it has an API aswell as IMC support. You can register custom Traveller's Gear Items with these, allowing you to make your own Cloaks and Pauldrons, or even Title Items. registerTravellersGear_0 is the command, where 0 represents the slto the Item will fit in. 0 for cloaks, 1 for pauldrons, 2 for vambraces, 3 for title scrolls. Should any of these be found, they will be called at the apropriate instances. When using the interface from the API, you are forced to implement these. Q: "Isn't 'Traveller's Gear' the Tinker's Construct Armor?" A: "Well yes. However, my mod used to be part of a more expansive RPG mod I was working on a few months ago, dubbed 'Traveller's RPG', because it was supposed to have you live more of a nomad's life in Minecraft. I never published, but mDiyo did, and he apparently decided to go for a similar name. Great minds think alike! :D "
Q: "ZOMFG! TOTAL BAUBLES RIPOFF!" A: "Apart from that not being a question: No. This is a mod designed to work along well with baubles, not to replace it and not to leech of its success. It just adds 3 more items that fit well in an RPG environment and provides extensive support for Azanor's fantastic mod. If you don't like that I'm trying to work along with it, don't play it." Q: "Can you add [some item] ?" Q: "You're items don't do anything." A: "I know. They are supposed to be like that. They are simply placeholders, designed to demonstrate what item fits into what slot. However, they are registered in the OreDictionary so that another mod I'm still heavily working on can use them in recipes in the future." 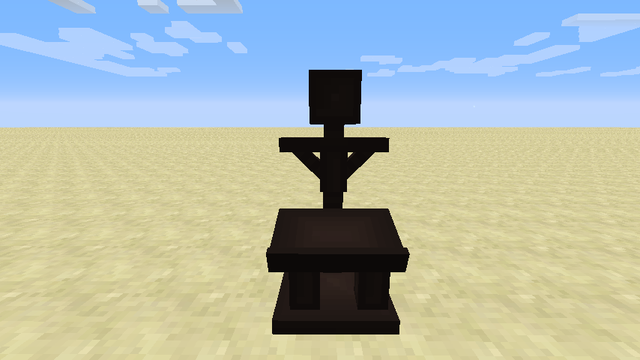 Q: "Can I use this in a modpack?" Tinkers Construct and the base of my networking code were made by the development team "SlimeKnights"
Hi BluSunrize, just to let you know i'm using your mod in a modpack im making with a friend of mine. Thanks! Using this in the modpack/server Rags 2 Riches, used it for a while and forgot to let you know, sorry! Does this mod have any associated permissions with it? I can't seem to find any listed but I may just be blind. The FAQ said to let you know about it. Also, a link will be porvided to this page, and proper credit will be given to you upon release of the pack. Is there any chance of ever having the mod for 1.7.10 working on servers? No one ever see's each other's things besides titles. Like I have a cape but no one sees the cape. It /does/ work on servers. I know modpacks and servers that use it. It works but things are not syncing up right. Titles do but the cape does not would be a good example. Could you please make the "travellers gear inventory" key close other inventorys like the vanilla inventory key does? Like if you have a furnace/chest interface open and hit the vanilla inventory key it will close your open inventory.. I have replaced my default inventory key with this one but it's a little annoying that it dosen't act like vanilla in that way.. I don't think it would be hard to do.. Pretty please? It's not difficult to do, no, but I'm not actively working on TG atm and don't plan any updates in the near future. "However, you may not claim this code as your own nor publicly distribute custom builds of the mod." Is it your private pack or is it publicly distributed? Private is fine. Public we'd have a problem with. I'm going to use your mod in my modpack! Could it be possible to add a Vanity Slot for armor? And if possible, support for death chest like Gravestone and OpenBlock. Only mod that seems to and something like that is CosmeticArmor, but it's old, and I don't think have a lot of compatibility. Also, is it possible to enchant gear like default pauldron and such? IF the relevant gravestone mod is written right, TG should work with it. I use the drop event so if someone catches that, the stuff is saved. There is no point to enchanting them, because they don't actually give you any armor value ^^"
Is there any possibility you may add support for Aether 2 inventory?